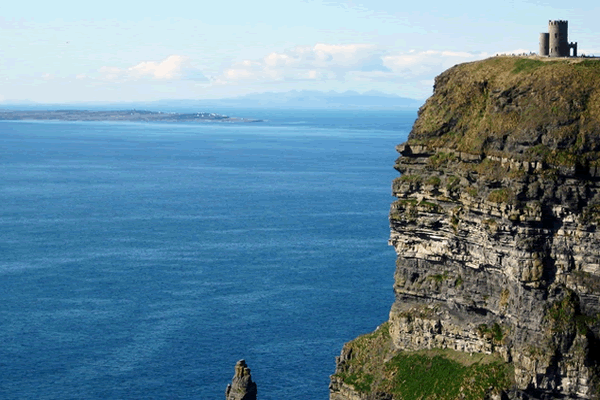 Cliffs of Moher - Ireland - O'Brien's Castle. Photo by Peter Potterfield. *Alfred Gralton's brother, Austin Sarsfield Gralton, was an International Rugby Union Scrum-half and played his first International game for Australia against Great Britain on 24 June 1899 and again on 12 August 1899. 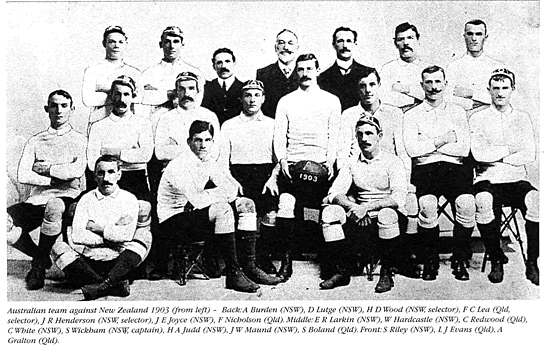 He then played at the Sydney Cricket Ground on Saturday, 15 August 1903 in the Head to Head New Zealand vs. Australia match in front of 30,000 people. NZ won 22 to 3. "Red! Red! Red! 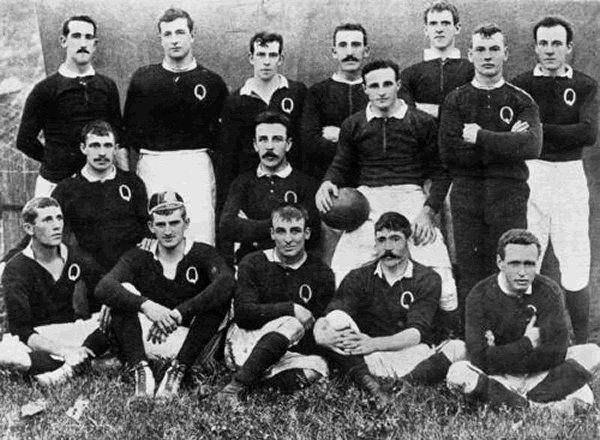 The Story of Queensland Rugby" by Ian Diehm. 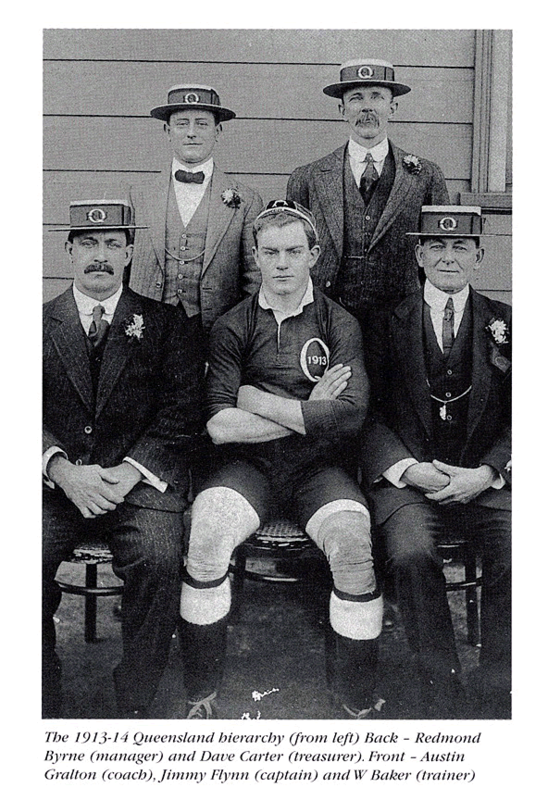 Biography of Austin Gralton - Detailed account of his football career from Terrace Rugby. Austin was born 9 February 1871 Kempsey, Macleay River NSW and died at the Albion Hotel in Sandgate Road, Albion on 26 June 1919. Austin was a farmer and carpenter and at the time of his death he was a hotel keeper. In the Gazette dated 3 March 1909 a William R Cordaiy was the Licensee of the Albion Hotel. In the edition dated 31 August 1909 the license had been transferred into the name of Austin Sarsfield Gralton. In 1911 Austin was recorded as the proprietor of the Albion Hotel and was so until his death in 1919. Following the end of WW1 a pandemic swept the world killing over 50 million people. Austin was on of the victims. Austin is buried with his son Austin Sarsfield Ireland Joseph Gralton born 1901 and Eva Mary Gralton born 8 September 1886 and her sister Adelaide Gralton born 3 November 1883 (Both daughters of James or Jas Gralton). Austin married Elizabeth Goddard 2 August 1902 when he was about 32 years of age. I have visited the site at Toowong and found his grave but the words are faded and I cannot read the other headstone. Directly opposite Austin's grave is the monument to Henry Gralton who of course is my Great Grandfather who came to Australia in 1858. Elizabeth Goddard was a daughter of Captain William Goddard, who was born on 26th January, 1835 in Beccles, Suffolk UK, and Elizabeth Allen. Captain Goddard was a well known Captain from the days of sail. Also in The Sydney Mail on 6th February 1897 you will find a good article about the life and times of Captain Goddard. Following the death of Austin his wife Elizabeth transferred the licence of the Albion hotel to Richard Baskerville Long from Toowoomba. The origin of the Irish name Sarsfield is from the 17th Century General Patrick Sarsfield. 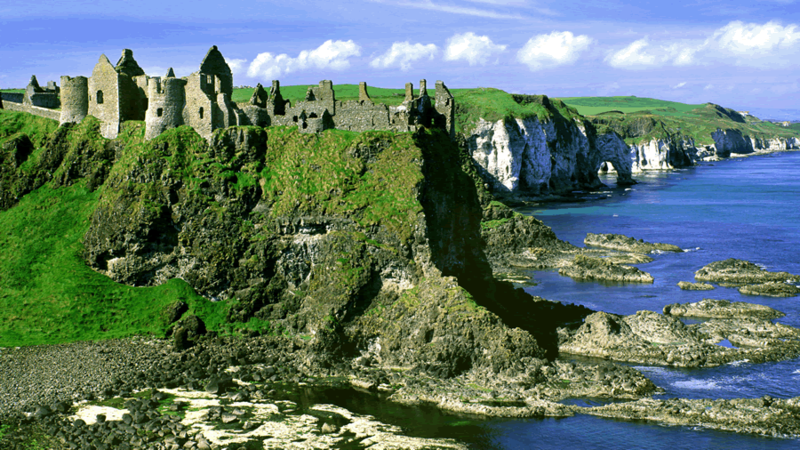 The Irish Saint Patrick came from Wales. The death of Mr. Austin S. Gralton, of the Albion Hotel, which occurred on Thursday evening, came as a shock to a large circle of friends. Three weeks ago Mr. Gralton had an attack of influenza, and complications supervening, he never rallied, the end coming suddenly. The deceased, who was 47, years of age, was the youngest son of the late Mr. and Mrs. Henry Gralton, and will be remembered by many as a brilliant footballer in his younger days, playing half-back for the North Brisbane and Christian Brothers' Clubs, as well as for Queensland in interstate matches. Even after his retirement from the field he continued to take a keen interest in the game, and frequently acted as coach to Queensland interstate teams. For the last ten years he had been licensee of the Albion Hotel. He is survived by a widow and an only son. The funeral took place to the Toowong cemetery yesterday afternoon. The Rev. Father Walsh conducted the service at the graveside. Wreaths and messages of sympathy were sent by "His Loving Wife and Son," "Katie, Jim, and the Girls," "John, Emma, and family," "Mick, Phoebe, and the Boys," "Nance and Arthur," "Winnie," Mrs. A. Gralton and family, T. Andrew and Belle, Mr. and Mrs. W. H. Gralton and family, C. Goddard, "Frank, Madge, and the Boys," "Allan, Ada, and family," Mrs.Turker and May, Archbishop Duhig, Rev.Father 0. Hayes (Beaudesert), Jessie and Charles Stewart, Mr. and Mrs. E. J. Carroll, Dan Carroll, the staff, Albion Hotel, Hon. P. Murphy, M.L.O., and Mrs. Murphy, Quinlan Gray & Co., also employees, Thos. 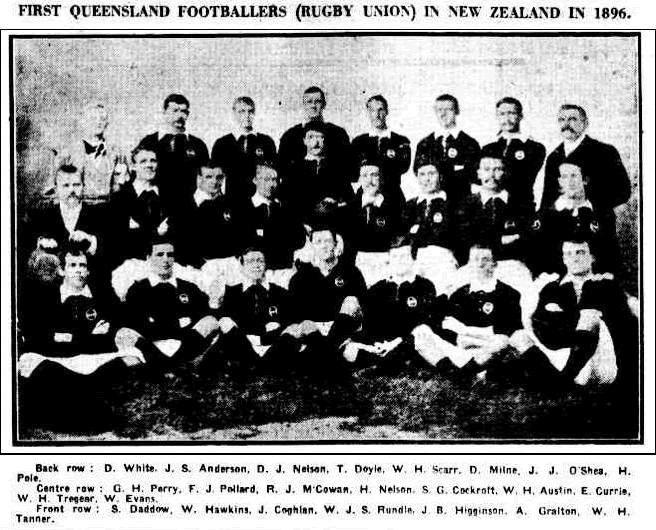 Brown and Sons, Ltd., Queensland United ' Licensed Victuallers Association, Perkins & Co., Ltd.. B. Seppolt &.Son, G. E. Lambert, Queensland Rugby Union, Owen Gardner and Sons, Mr. and Mrs. M. Baldwin, Mr. and Mrs. Higham. Miss Jarvis and Miss Hartigan, Mr. and Mrs. McGavin and family. Mr. and Mrs. W. J. Tucker and family, Mr. and Mrs W. Maher, W. Maher, junior, J. R. Anderson. J. Gustavson and family, Mr. and Mrs. J. Crisford and family, Mr. and Mrs. S. Crisford, Mr. and Mrs. F. Neidler, Mr. and Mrs. J. Gain, Farquhar Black, Carroll family (Goodna), J.P. Flynn, Mr. and Mrs. J. A. Cockerell. L. D. and C. C. Dixon, Mrs. Dunne and family, L. Dunne. Mr. and Mrs. A. Cruse, and Clara, Mr. and Mrs. G. R.Sayle, T. F. Webb and family, J. Ahern, Powell and Hetherington, D. A. Colley, Mary Stewart, Frank Sunners, L. Phillipson, and others. "Mick, Phoebe, and the Boys" - Michael Costigan and Josephine Mary. Phoebe was Austin's sister. Mr. and Mrs. W. H. Gralton and family - William Henry (son of Alfred) and Marie Guthrie Gralton. Archbishop Duhig - Sir James Duhig - Catholic Archbishop who also attended St Joseph's Gregory Terrace, Brisbane and was born in the same year as Austin Gralton and was in his class. More information on Archbishop Duhig. W.H. Gralton (Snr) and Marie Guthrie Gralton are my Grandparents. Page Authority 12/100 - Moz Ranking 3.30 /10 - Domain Authority 19/100 on 23/10/2015 - 1 Link. Page re-published 07/10/2013.